In a Nutshell: Identifying trends and analyzing web metrics are necessary tasks in today’s digital marketplace, but some solutions go further in unearthing insights. While many analytics companies can provide detailed information on website traffic, BuiltWith is a unique tool that mines online data to identify information on the technologies used to build and run websites. This data can be filtered by parameters such as industry, geographic location or web traffic, to quickly generate potential B2B leads. BuiltWith also provides weekly trend reports on the hottest technologies websites are using. What began as a hobby for Co-Founder Gary Brewer soon became a business in 2007. And, now, BuiltWith serves as a valuable tech tool for retailers and others looking to gather data and trend information to guide their next steps and target prospective clients. Ten years ago, Gary Brewer was intrigued by startup companies — their origins, how they operated, and what kind of tech they were using. But as he researched the companies, he couldn’t find an easy way to see how they were built — digitally speaking. Gary Brewer’s interest in the platforms startups use led to his co-founding BuiltWith. So, Gary turned his website technology curiosity into a business. He co-founded BuiltWith, a tool that tracks and shares information on more than 21,130 technologies used by more than 250 million websites, including web hosting companies, shopping cart platforms, content management systems, and analytics programs. Businesses rely on data to generate sales leads, but until BuiltWith came along, the process of capturing that information was arduous and inefficient. Now, users can quickly filter this information based on retail area, geographic location, web traffic, and other criteria to generate leads. BuiltWith also generates weekly reports tracking the trends on the hottest technologies used on the web, providing companies with a complete picture of the most effective digital applications in their industries. Since day one, BuiltWith has offered a free lookup tool for the technology behind individual websites. As demand grew, Gary began offering subscription services to allow users to collect and analyze more data. Most subscribers use BuiltWith to generate leads for their businesses. For example, a website optimization company with a focus on WordPress could filter all websites in their area that use WordPress, creating a digital list of potential customers in minutes. Companies seeking new clients can also look at specific retail industries — like clothing or automotive — to view which platforms and software prospective clients are using to run their business websites. That research can make sales pitches more informed and efficient. “When you reach out to those people, it’s less cold, much more knowledge-based,” Gary said. And reports are responsive for the most highly customized filters to quickly identify targets such as clothing e-commerce sites using the Shopify platform to run their online store and Facebook Custom Audience to reach customers. Customer testimonials highlight some of the tool’s success stories. For instance, EtailPro, an SaaS solution designed to help e-commerce brands grow, used BuiltWith as a lead list tool to identify both competitors and business prospects. The B2B lead generation is just one aspect of BuiltWith, though, as the site also generates insightful reports from the mountain of data points it collects and tracks. BuiltWith offers companies a big-picture look into the most used web technologies with reports updated weekly. The site tracks more than 21,130 technologies across more than 200 different categories and subcategories — including analytics packages, A/B testing tools, hosting providers, e-commerce platforms, content management systems, and more. BuiltWith then aggregates data about usage across all of the sites to show which technologies are gaining or losing users across the web. 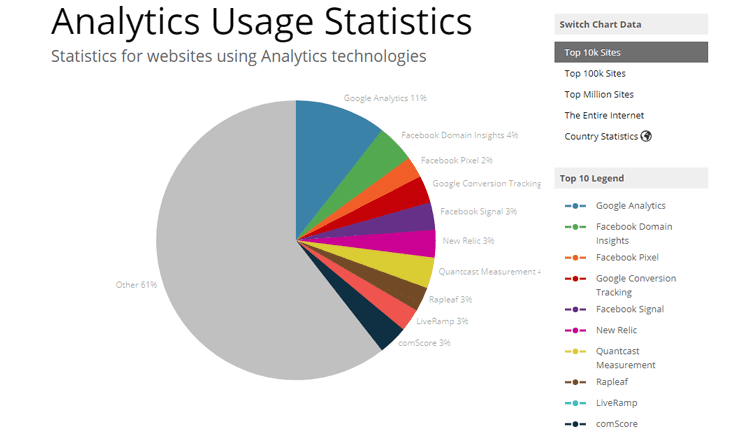 BuiltWith can provide insights about which analytics platforms are most effective across industries. For example, reporting can show how Google Analytics, the most used analytics platform on the web, fares from week to week, and where they stand in comparison to past quarters. A business could track Amazon’s growth as a cloud hosting provider but also see that Internap and SingleHop are showing gains across multiple levels of web traffic. Trend data can be particularly useful for the investment arm of a company that wants to see which technologies are seeing rapid adoption and growth and which are losing ground. BuiltWith also gives companies extensive data sets that they can export into their CRM and marketing platforms — like Salesforce. Businesses can efficiently gather and filter data to create reports that include website domains and metadata such as telephone numbers, emails, and addresses. The data can also be used to generate custom audience email lists for advertising; matrix reports that show the array of technologies a domain uses; reports to show which websites share common ownership; and a CRM-friendly list of companies, people, and contact information. “You can keep your Salesforce CRM pumped up with all of that data automatically, and you can use the reporting capability to retrieve new info every day,” Gary said. 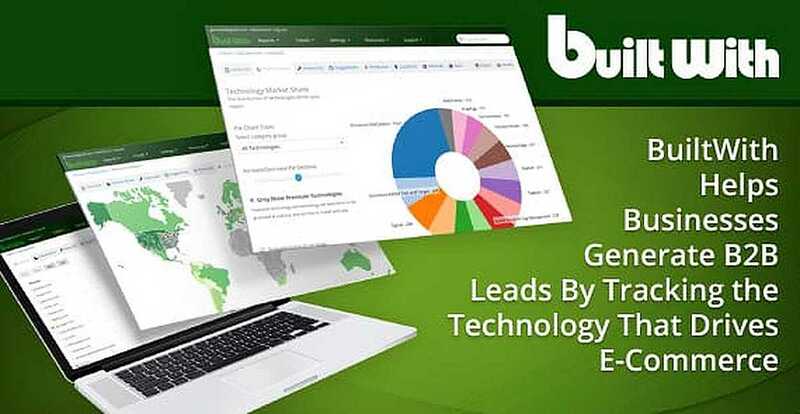 Owners of technologies such as Magento are also able to use BuiltWith reports to gather more information on their customers, including their industries and how many are using a free version of their product or a paid subscription. 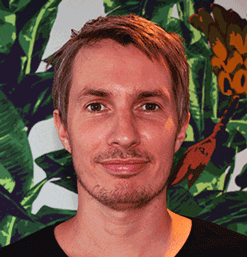 A decade after its founding, BuiltWith remains mostly a one-man operation based in Sydney, Australia — but with a global reach. The site continues to research the existing — and emerging — web technologies used by a quarter billion sites, generating valuable data that is used to identify trends and generate leads. “There’s always something to think about how to do,” he said.